Composition Systems Inc. (CSI), of Falls Church, Va., has made a name for itself as a full-service digital print provider serving the Washington, D.C., metropolitan area, Virginia and Maryland as well as national accounts during the past 30-plus years in business. As a printing and graphics firm, CSI offers a variety of printing services from offset printing to super-wide grand format printing to produce exhibits and displays, interior and exterior signage, banners, and vehicle graphics on a wide range of output materials. When it comes to creating stand-up displays, CSI turns to durable-yet-lightweight Gatorfoam® graphic display board by 3A Composites USA. Gatorfoam was CSI’s substrate of choice when it recently created a unique stand-up display to promote its own services at a company open house. 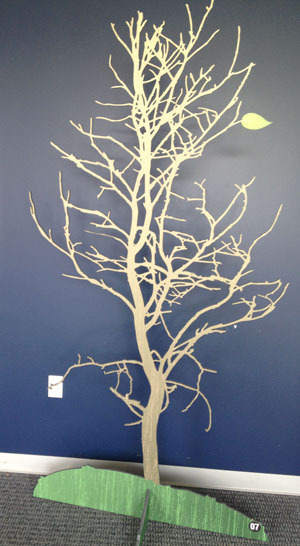 To illustrate environmentally friendly materials in a “green” corner at the open house, CSI graphic designer Eric Seffinga created a nearly 8-foot-tall stand-up display depicting a tree sporting just one green leaf amid a series of twisting brown branches. The intricate design – created in Adobe Illustrator CS – offered CSI employees the opportunity to test cutting Gatorfoam with an Esko Kongsberg i-IXL24 router. CSI used the company’s Inca Onset S70 UV flatbed to direct-print the tree image onto a 48-inch by 96-inch sheet of ½-inch thick Gatorfoam featuring a black foam core bonded between one bright white facer and one black facer. CSI employees fed a vector file into the router to cut the tree pattern. Two trees were cut in a process that took more than four hours (two hours per tree) to complete. 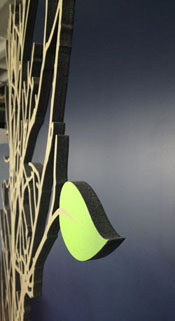 Harris said CSI uses Gatorfoam to create stand-up displays for retail locations, trade shows and associations. Harbor Sales Co., a 3A Composites USA distributor based in Sudlersville, Md., supplies Gatorfoam to CSI. For more information about CSI Printing & Graphics, visit www.csi2.com. For more information about Harbor Sales, visit www.harborsales.net.